A team of Brisbane-based creatives, alumni, students and teachers have been assembled to create an interactive story based in their local city. Dr Gill Lawson from QUT Design Lab’s Design Education Research Platform kickstarted the creation of a unique adventure story with a storyboarding workshop held at QUT Gardens Point Campus in April. 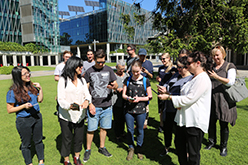 The Story City app-based interactive story will coincide with the 50th anniversary of Landscape Architecture at QUT this year. The story, focused on place-making, will inform and entertain local, interstate and international visitors about the inner city Brisbane landscape through the eyes of landscape architects. Dr Lawson said she wanted to highlight the proud history of landscape architecture education at QUT for the last 50 years and its contribution to the local environment. “What better way to mark our anniversary, than by designing the story in collaboration with our past, present and future alumni,” the Senior Lecturer explained. The workshop was facilitated by Joon-Yee Kwok, an arts management practitioner and PhD candidate working on digital place-making. Young minds from years 11 from Indooroopilly State High School and QUT landscape architecture students from years 2, 3 and 4 collaborated in the workshop to ideate a story about the history and contemporary design of five locations in and around the School of Design at Gardens Point. 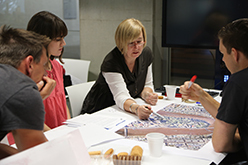 They were joined by Vicki Martin, Principal of Urban Design in City Planning & Economic Development at Brisbane City Council, who offered insights into how city locations have developed over time, particularly through the work of landscape architects and urban designers. As a QUT landscape architecture alumnus, Vicki wants to showcase the contribution of landscape architects to contemporary Brisbane. The capital works projects specialist said she is pleased to be working with a talented pool of creatives passionate about the local environment. As part of the process, some students will be invited to visualise and create their story ideas in virtual reality with the Brisbane-based company Ai3D in a second workshop in May-June. Ai3D director and QUT landscape architecture alumnus Nathaniel Harrold said he is enthusiastic about telling the hidden stories of Brisbane using the latest technology. “It’s great that we can be involved to highlight the huge role that virtual and augmented reality will play in the landscape architecture profession in the future,” he said. The Story City adventure story will be added to the growing library of interactive and ‘choose-your- own-adventure’ digital stories featured on the Story City website, created by founder Emily Craven. A mix of cultural tourism and adventure, each story is created specifically to highlight the beautiful or intriguing parts of a real-world site and to appeal to and excite a young, tech savvy audience. The stories are designed to bring real-world locations to life, converting an ordinary, everyday space into an adventure filled wonderland. The QUT Landscape Architecture Story City adventure will be launched on 21 November 2017, to coincide with QUT Landscape Architecture’s annual end-of-year graduate exhibition and student awards ceremony at the School of Design, Gardens Point. “We are looking forward to greeting as many of our past, present and future students, their families and friends and industry partners as possible, and being able to showcase to them our QUT landscape architecture adventure,” Dr Lawson said. The Story City project represents the first student collaboration conducted as part of the Indooroopilly State High School Innovation Hub project, an MOU with QUT Design Lab and Indooroopilly State High School. “This is a great opportunity to demonstrate to future students, the many exciting career paths possible through QUT Design courses, in particular the many facets of the wonderful world of landscape architecture,” QUT Design Lab Design Education Co-leader Natalie Wright said.